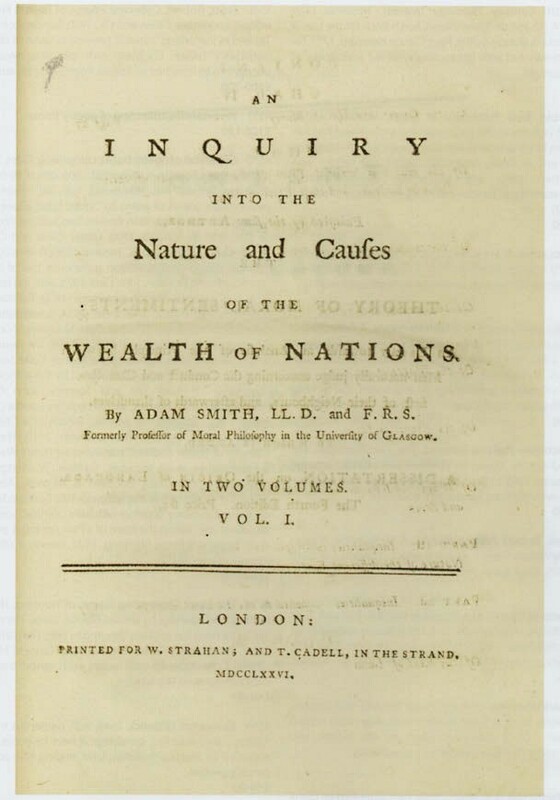 The last-minute discovery of a 1776 first edition of Adam Smith’s '…Wealth of Nations' was a magical, unforgettable moment for a Derbyshire saleroom’s book specialist. Extracted from beneath a silver cabinet where the owners of a Staffordshire country house used to store such diverse items as “hymn books and boxing gloves”, it delighted Jim Spencer as it went on to sell for £65,000 to a UK phone bidder by Hansons (20% buyer’s premium). It was part of an October 11-16 series of sales held at Bishton Hall that featured both contents of the house and fine arts in various categories from other sources. This copy of Smith’s great work proved to be one of the star turns among the thousands of lots being offered. The bindings of full contemporary calf were somewhat worn and scuffed, and in Vol.II a few pages had been bound in the wrong order, as acknowledged in a contemporary footnote, but essentially it was a good, clean example of this famous economic text. The selling price just edges the Bishton Hall copy into the top halfdozen prices achieved at auction, but recent years have produced some very high bids indeed on Smith’s great work and three copies have sold for six-figure sums. Right at the top of the pile is a copy in a repaired contemporary binding that sold for £150,000 at Christie’s in 2014. With some errata corrected in manuscript, this was a presentation copy and was inscribed (in a secretarial hand) to the author’s friend and former pupil, Henry Herbert, Lord Porchester and 1st Earl of Carnarvon. 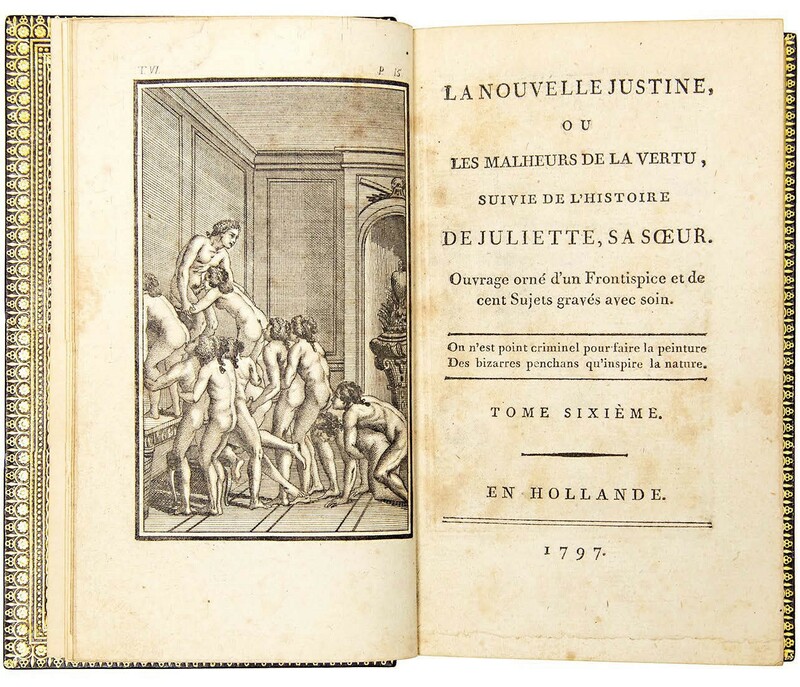 Another of the higher-priced lots in the Hansons sale could hardly have been more different – offering six of the 10 volumes that make up the Marquis de Sade’s La Nouvelle Justine… Banned by Napoleon but here lovingly bound in full calf gilt by Lortic, these six volumes of 1797 sold at £8200. One lot that generated a lot of media interest – and a bid of £2100 at the auction – was a manuscript journal kept by a nightwatchman to record events in the Belper district of Derbyshire in the years 1833-35. Running to almost almost 400 pages, its compiler is not directly named, though nearly all entries are signed off by a ‘W Bamford’. A disturbance at a ‘Gin Shop’ was one of many entries related to drunken excesses, another being a note that one Sami Marsh came to work “beastly drunk and behaved very improperly”. Herbert Spence was one of four people (young lads?) caught stealing apples from a “Mrs Tolpises of the Holly Seat, Shottler”. Found to have “…about 2 pecks of Pears in a Bag [he] was locked up and took before the Magistrates when he was sentenced to 3 Mo’s Imprisonment”. Sold for £3400 was a lot that included a manuscript diary kept by a John Spencer of the 7th Dragoon Guards during the years 1857-67 that he spent in India. Comprising a 224pp diary of events and 138pp of his verses, it was accompanied by a separate volume of his sketches. 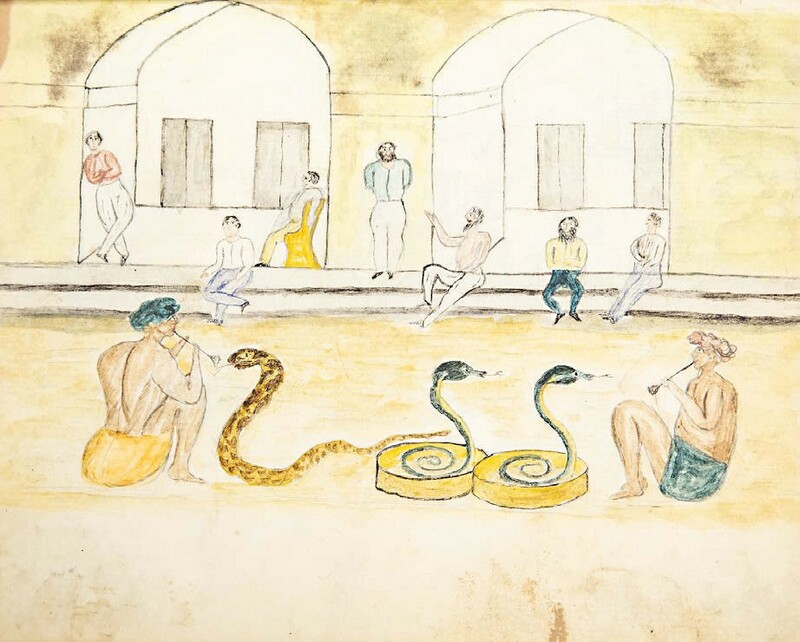 Dated 1862, the latter featured some 33 rather naive watercolours, one of which shows British officers watching snake charmers. It also held a number of pencil sketches. Other highlights in this sale of more than 400 lots included two 17th century embroidered book covers, one of which, depicting Charles II and Catherine of Braganza within oval medallions, sold at £1400.